Putting the peasant back into this peasant food inspired haute cuisine dish. This is only vaguely close to the cooking processes used for this dish today. It’s easy and tasty this way though…and I don’t argue with tasty. She fights dirty. Ofcourse, the other thing that makes this dish a good idea for hungry hobbits all over the world….MUSHROOMS!! See? Tasty fights dirty bigtime. 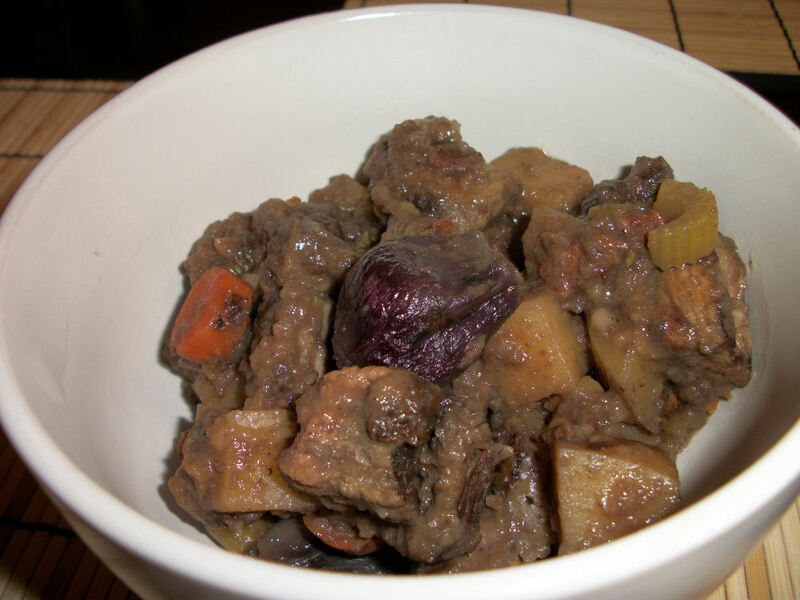 The key to make this healthier is really in the cut of your stewing beef. Try to get one that only has a bit of marbling. If you can get sirloin stewing beef then you are golden. Some butchers offer “steak ends” which are the bits they cut off those sirloin steaks to make them beautiful. These are awesome lean cuts that are perfect for this dish. The other reason I absolutely had to post a beef dish today? I was watching ‘Come Dine with me Canada’. On it was this woman who kept complaining that when she was dieting all she could eat was chicken, that is why she dislikes chicken. Sheesh. No idea what diet she was trying but I seem to be doing just fine and NOT living on just chicken. So there. It’s not a beautiful picture, as I embraced it’s peasant roots, but it sure was tasty. Heat a pan to medium, add bacon, garlic and mushrooms. Cook until the bacon is crispy. Drain the fat and pour into a crockpot. Toss the beef in cornstarch to coat then add to the pan and brown. You just want to sear the meat here, not cook it. Pour into the crockpot. Deglaze the pan with the red wine, scraping off the browned bits from the pan. Pour into the crockpot. Add the remaining ingredients to the crockpot and allow to cook on low for 8 hours or high for 5 hours. Makes 4 servings. Each serving contains 278 calories, 5.7 grams of fat and 3.8 grams of fibre. Very diet friendly to me. Living on chicken, heh, the very idea! Now a part of me would call this a coq au vin rouge but…since I’m not using a rooster it just doesn’t seem all that traditional. 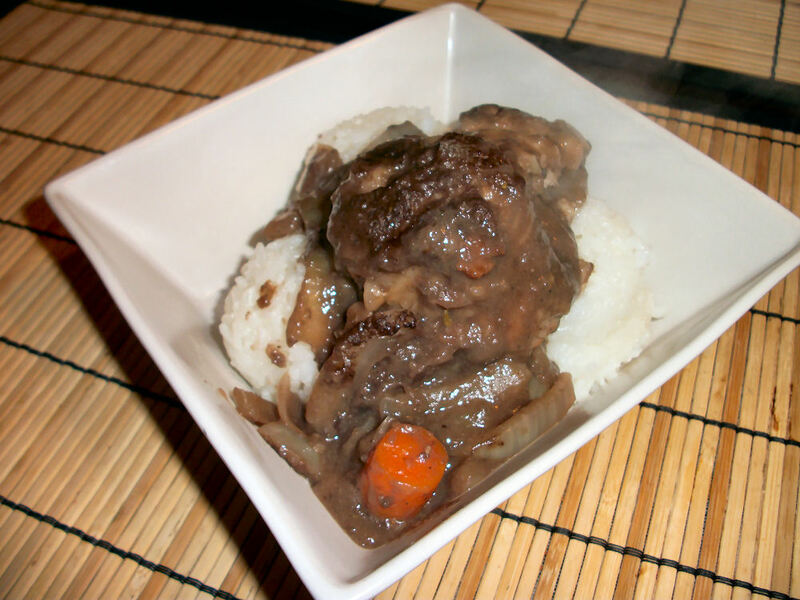 Now if you are looking for a cheaters version of coq au vin, then I think I can help you out. Not only is this a lovely fancy sounding dish it really is quite economical. It would amaze the people in finances when I would tell them how much I spent on groceries and that the week of groceries included dinners such as coq au vin. I’m not sure why though considering the dish has humble rustic beginnings. Since we are all trying to save a bit before those holidays hit us, I figured this recipe might come in handy for some folks. Combine the flour, salt and pepper in a bag. Add the chicken and toss to coat. Heat a sprayed pan to medium high heat. Add the chicken and cook until browned, 2 minutes per side. Transfer the chicken to a crockpot. Add the bacon to the pan and cook stirring occasionally for one minute. Add the onions, mushrooms, remaining flour and garlic. Stir in the wine to deglaze. Transfer to the crockpot. Add the remaining ingredients to the crockpot. Cook on low for 6 hours. Remove the bay leaf before serving. This makes 4 servings. Each serving contains 275 calories, 5 grams of fat and 4.5 grams of fibre. Great served on rice if you really need a super filling meal or with a side of lovely crusty bread. Delicious! These tasty little cakes gave me an excuse to drag out my cute little slider maker again. That thing is just so adorable! It makes the perfect little patties too. I love kitchen gadgets I really do. In the game catfish cakes are made with: catfish, barley flour, egg, and butter. This time I took a native inspired recipe for crab cakes and substituted catfish. Since catfish is kind of hard to get around here I think I will stick with the crab cake version in the future. Either way is nummy though! Shall we? Boil the potatoes until tender. Drain. Mash with margarine, salt and pepper. Add remaining ingredients except the flour to the potatoes and mix thoroughly. Form into 1″ thick mini patties. If you would like an extra coating you can sprinkle each patty with a bit of flour. Totally optional as it is tasty without it too. Bake at 450F for 7-10 minutes, flip once during baking or pan fry 3-4 minutes per side on medium high. I enjoy these served with some sweet heat mustard. Yum! Makes 7 cakes. Each catfish cake contains 72 calories, 2.8 grams of fat and .6 grams of fibre. That includes the flour coating. 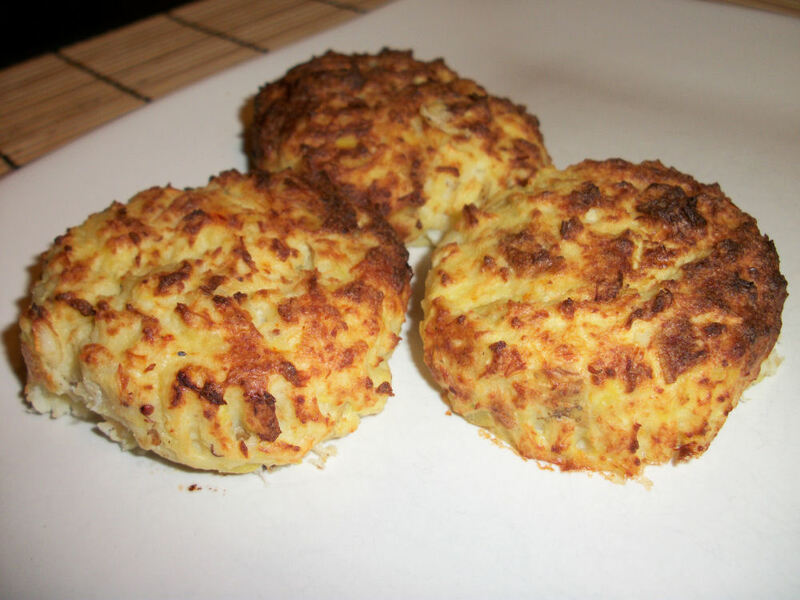 If you chose to go the crab cake route it is 57 calories per cake, 1.6 grams of fat and .7 grams of fibre. That does not include the flour coating. My husband wanted to make a fun veggie side dish using whatever we had in the fridge. It was proclaimed that this side dish would be a slaw of some sort, without cabbage since we had none…and tasty somehow. Once we got to the stage where I was mixing and tasting the dressing we realized it was kind of a pretty slaw with all its colours so it was named confetti slaw. We had this as a side with some crab cakes I had made and it was nummy! So low calorie and so filling. Just plain can’t go wrong there. Core the apples. 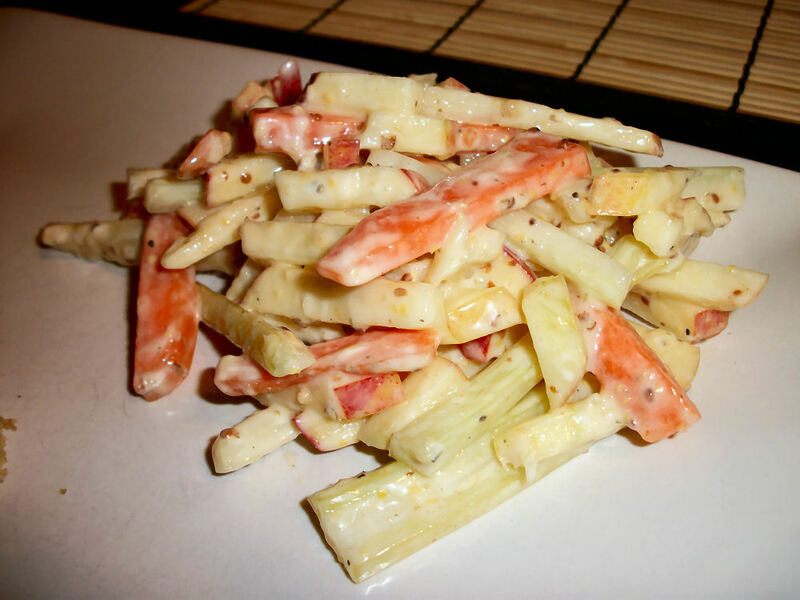 Slice the apples, carrots and celery into matchsticks. My husband went with chunky matchsticks but thinner ones would be tasty too. Add the remaining ingredients. Combine thoroughly and allow to sit atleast 20 minutes. The longer it sits the better the flavours combine. Makes 6 servings. Each serving contains 111 calories, 4 grams of fat, and 3.8 grams of fibre. I don’t think this would keep very well so its best eaten the day of. If you need less for your dinner this recipe will cut in half to create 3 servings very easily. Enjoy! When it’s been a rainy mess all week it is so nice to come home to an already bubbling crockpot full of soup. This works really well with my turkey broth recipe as a base. Just another way to use up those leftovers in an oh so tasty way and warm your core temp. 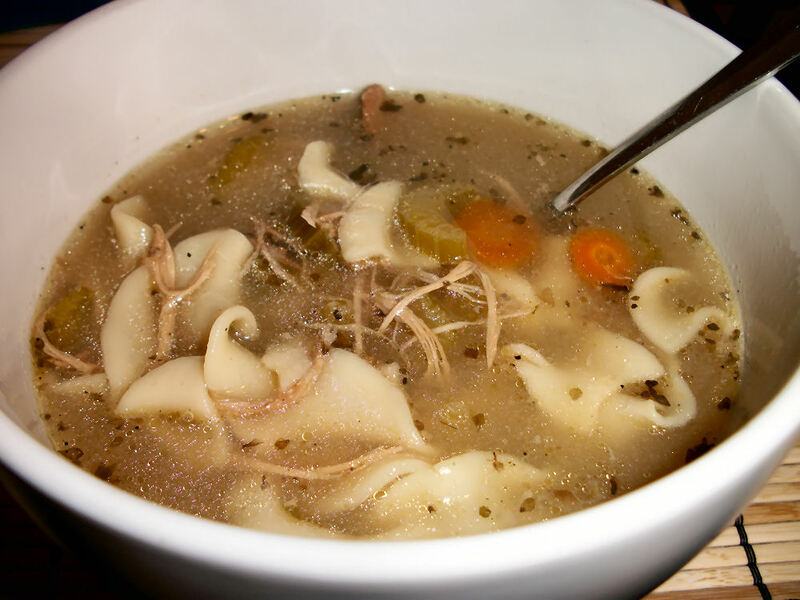 I usually make a turkey barley soup from my broth but this time I wanted to do something a little different. Besides, why should chicken continually hog the noodle love? Selfish, selfish chicken. Slice up the veggies, add even more if you like. Can’t hurt! Room for variation here. Add all of the ingredients to your crockpot. This makes approximately 8 1.5 cup servings. Each serving contains 113 calories, 1.9 gram fat, and 1.6 gram fibre. This is a lovely filling meal, served with a nice bun and salad you have yourself a great comforting feast! I couldn’t believe how full I was after that. I’m thinking the noodles played a part in that one. Num! So apparently this dish comes to us from the chinatowns that have cropped up in various major cities on the African continent. To me it sounds like yet another delicious way to use ground beef. You see, I’m usually not much of a ground beef user but I ended up with a bunch of it in my freezer so I’ve been trying to work on ways to use it that aren’t my usual burger or slider standby. 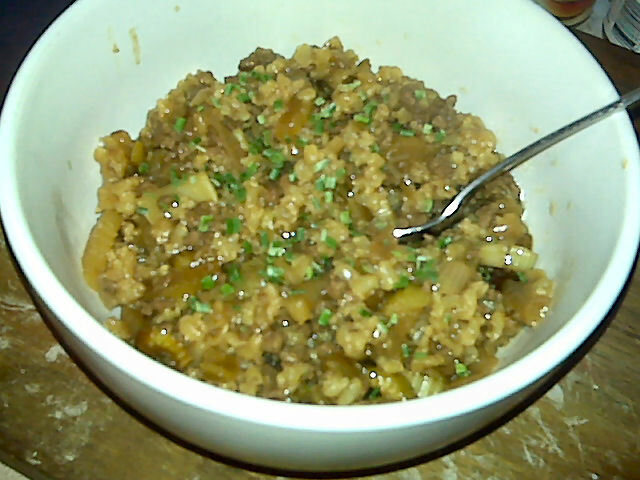 The dish is mainly ground beef, celery, and rice, Nice and simple. I have no idea how authentic my flavour is. My dad is the one who has visited several countries in Africa not me. So here is my effort based on what I’ve had described to me. Use a large wok to sautee the onions until the edges turn slightly brown. Add the ground beef. Cook until browned. Drain the fat. Add the other ingredients to the pan and mix well. Pour the ingredients into a casserole dish and bake, covered, for 45 minutes. Stir and return to the oven uncovered for 30 minutes. Allow to sit for 5 minutes before serving. Garnish with chives (optional). This makes four servings. Each serving has 484 calories, 26 grams of fat (lower this by using extra lean), and 2 grams of fiber. I know at first glance that may seem like a lot but consider this is a one dish meal. You have veggies, grains and proteins all in one. I served this all by itself and went from starving hungry (I was late getting dinner going) to happily satisfied with just one serving. I liked it so much I’m actually having a serving leftover for lunch today…as is my husband. This dish was a bit of a crowd pleaser. My husband came home yesterday with a headache and completely drained of umpf. At this for dinner and was back to his old self. Maybe that qualifies this as a comfort food?